The finished boat, painted Lucan Red. The color was taken from a battery box cover lent by the owner of a 1969 Donzi Ski Sporter. In Professional BoatBuilder No. 135, the article “Wood to Glass” previews the making of a virtual exhibit of boats, designers, and builders significant during the years 1940–1970, when wood as the preferred hull and deck material gave way to fiberglass. Readers are asked to contribute stories and photos to the virtual exhibit, which eventually will become a physical exhibit traveling between our partner institutions: Mystic Seaport, Mariners Museum, and the MIT Museum. This project was instigated by Paul Herzan, a member of the Board of Directors of the Cooper-Hewitt National Design Museum in New York City. 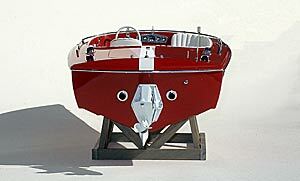 Herzan has a special affinity for the early fiberglass powerboat designs he knew as a youth, especially the Donzi 16 (4.9m), designed by Walt Walters (see “Walt’s Way,” PBB No. 134). 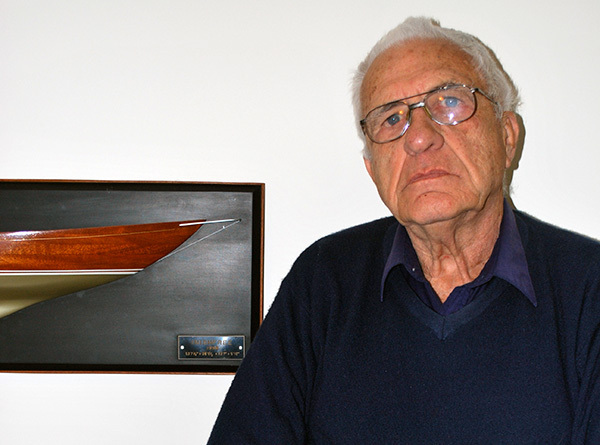 Herzan persuaded Walters to donate his papers to Mystic Seaport, and to augment the collection, Herzan donated this beautiful 1/12-scale model of the popular Donzi sport boat. 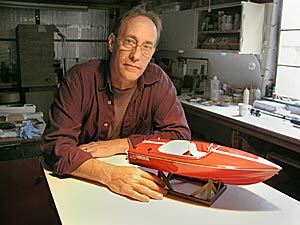 Curtis Miller of St. Petersburg, Florida, made the model employing many of the same techniques found in full-size, real-world fiberglass boatbuilding. Miller knows those techniques well, having worked for many southwest Florida builders, including Morgan Yachts, Windship Trident, Wellcraft, and Donzi, serving as loftsman at the latter. Here is Miller’s description of the project. Construction of the scale replica Donzi 16 began in the summer of 2000. I had access to boats of that model and year, from which I took offsets. Having been employed by Donzi Marine, I was also able to take measurements from current versions of the Ski Sporter and their molds. Once I’d compiled the dimensions, I drew a set of lines in 1″ = 1’0” scale. To the left are four sanding guides for the bottom and topsides of the hull in profile. They were used to shape the two larger blocks to the right that make up the hull plug, shaped in profile, ready to be carved in plan view and assembled. The four white strips in the middle are templates that determine plan and profile sheerlines, chine, and keel. From late 1960s brochures of this boat that had lines drawings of sorts, I photocopied and enlarged various layouts in plan, profile, and section views. When checked against the actual dimensions, there were distortions, so I was unable to use them as reliable references. I overlaid these copies with drafting film to get a rough idea of the overall shape and establish my building grid. I then applied my corrected offsets to the grid and drew new lines that became the shop drawing from which I constructed the model. The carved deck plug and flange, resin coated and receiving an initial coat of primer. For deck details such as the engine hatch, cockpit layout, and fitting locations I worked from extensive photos and notes. The dimensions were taken off a deck from a 1969 model that had been stripped, with all the hardware out of the way, but clearly marked by mounting holes and sealant prints. Top—The outdrive carved from wood. Above—A jeweler made silver castings of some parts, including the plate and mount. For details such as metal parts, I worked directly from sketches laid out to scale on the raw material, whether it was wood, wax, or brass. The same was true for much of the rest of the boat. I drafted parts such as the steering wheel full size to get spacing of the spokes and round slots in dimensions that could be easily measured, and then used those figures, scaled down, to mill the original parts. That part was later chromed by Rich Remillard of Adtec II Electroplating, and became part of the model, but prior to that a rubber mold was cast from it. The majority of the other metal parts, the cowls, dashboard, fuel cap, and lifting eyes were developed and molded in much the same manner. 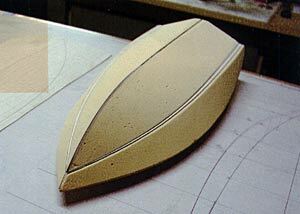 The hull plug being rough-shaped to the finished dimensions. The veneer showing will end up being the finished chine once the carving is completed. After this stage, the part was coated with several layers of polyester resins and primers. The major components such as the hull and deck were constructed similarly to the tooling practiced at modern day fiberglass production boat plants. I built the hull and deck plugs from foam blocks carved to the profile contours and covered in thin wood veneers that were patterned from the shop drawing. After establishing the basic shapes and fairing the surfaces, I coated the plugs with polyester primers and added second, third, and in some cases, fourth coatings and subsequent fairings in preparation for the molding process. 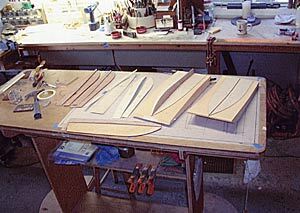 Toward the later steps, having fashioned details such as strakes from wood, I added them to the hull. I built a plug of the cockpit, inverted like a male mold to ease shaping and tooling of the sides, seat bases, and floor hatch recess. 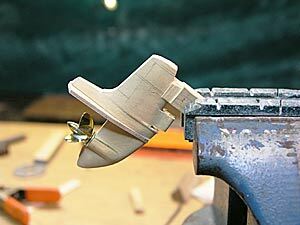 I cast two parts from this mold, one of which was inserted into the partially completed deck plug. I used the other as a base to form the seat cushions and to pattern the foot well. 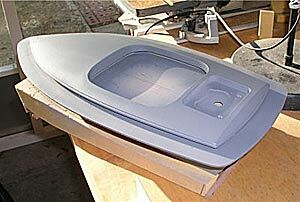 Once the plugs for the fiberglass components were completed, I took fiberglass molds of the parts. The glass parts were shot in appropriately colored, custom-blended gelcoats. 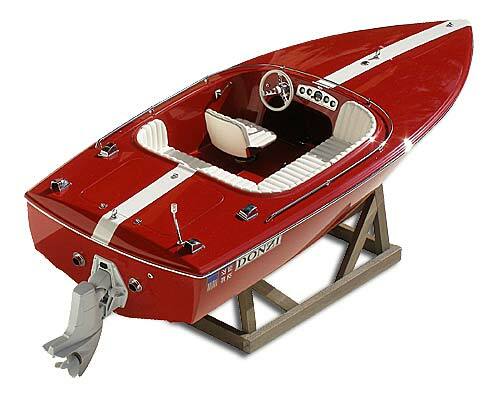 There was much debate among collectors and aficionados as to what the early Lucan Red actually looked like, as most of the example boats from that era had suffered fading and/or were repainted at some point. What finally settled the decision was a battery box cover lent by a gracious owner of an actual Lucan Red 1969. Being under the seat, protected from the sun, the cover was in excellent shape. 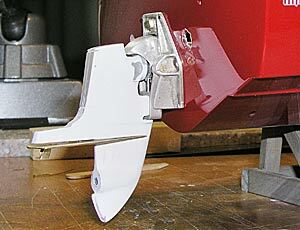 In addition to the main components, such as hull and deck, there are 81 smaller parts. 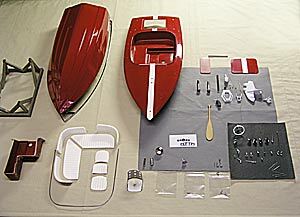 After matching the color scheme and accessories to a boat in the 1969 Donzi catalog, I painted the stripes, seat cushions, and the outdrive on the model. Marjorie Miller scanned, assembled, and digitally scaled down original Donzi logo and flag insignias. Then, using digital photos of an instrument cluster from a comparable boat, she created the gauges. This required blowing them up and retouching shadows, reflection, and haze on the dials. The images were scaled down and rearranged to correspond with the openings in the instrument panel and then printed on synthetic gloss photo paper. The same process was used to make the appliqués of the insignias. Top—The beauty of the Donzi 16 is in its simplicity; yes, sometimes less is more. Above—The model was donated to Mystic Seaport, Mystic, Connecticut. After the application of stripes and insignias, I painted the exterior of the boat with two coats of high-solids polyurethane, which was rubbed out and buffed. Much of the metalwork is cast silver, polished, and then chromed. Smaller portions of the outdrive were cast in silver, primed, and painted. Rick Butcher of Artisans Gallery cast silicone molds of my original masters; using the lost wax method, he formed wax parts that later became the silver castings. After the cast parts were tooled and polished, they were finished in chrome plate by Rick Remillard. The lower unit and outdrive body are poured casting resin. I initially carved from wood the tooling for the outdrive components, with the exception of the propeller, which was fabricated from brass. Like all the other wood tooling, I sealed the components with polyester primers; I carved details such as casting seams into the primer. Once the shape, detail, and finishes were established, I took latex molds of the individual parts. The rubrail is made from 0.0125″ (3.2mm) aluminum sheet stock, recessed for the hull on the bottom surface and sandwiched between the hull and deck. Most of the deck fittings such as stanchions, cowls, and hinges are on #1-72 threaded studs, through-bolted with nuts and washers. The hub cover on the steering wheel is the head of a #6-32 brass machine screw that serves as a fastener for the wheel and bezel. The exhaust tips are made from 0.025″ (6.4mm) brass tubing silver-soldered to washers, lathe-turned to size, and then chromed. The lens for the stern light was made on a lathe out of solid acrylic. The bellows on the drive unit is made from shrink-tubing heated onto a ribbed wooden form. Curtis Miller spent six years building the model. He stopped counting his time at around 1,200 hours, about halfway through the project. This project was roughly six years in the making. I attempted to track the total man-hours but abandoned that effort at around 1,200 hours, when the model was about halfway complete. To everyone whose dedication, patience, and persistence played a major role in the creation of this scale replica, I am profoundly grateful.